Yesterday was what I consider a quintessential Seattle fall (or even summer) day: sunny and perhaps on the chilly side in the morning, but by afternoon, I could take the top down for my drive home. At 73 degrees by mid-afternoon, it doesn’t get any better than that. Meeting with Urban Sketchers Seattle at West Seattle’s Jack Block Park, I walked to the farthest end of the park where I had sketched the downtown skyline more than three years ago. Sketching it again on that beautiful morning seemed like an ideal celebration of quintessential Seattle. 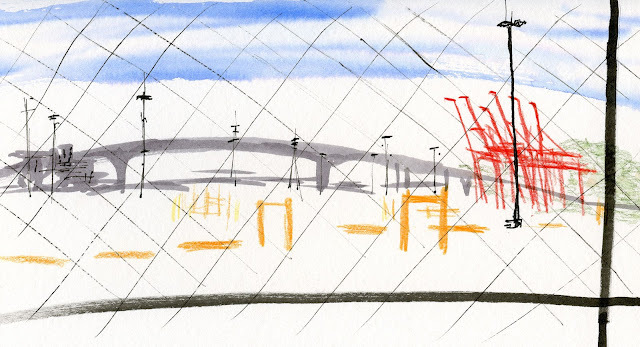 With a small pocket of time left until the sketchbook sharing, I went over to the other side of the park where I had spotted a rare view of the West Seattle Bridge on the other side of a chain link fence. Lunching afterwards on the sunny deck at Salty’s on Alki, we all mentioned what a treat it was to dine al fresco with a view of Elliott Bay. I drove home feeling bittersweet, knowing that our days like these are numbered, at least for this season.